5 Steps to help children deal with loss. Embracing the passing of a loved one is an uncomfortable position. In one moment you're running errands then you get a text and your mind goes blank. The next breath hurts and this news changes everything. More importantly, what do you tell the rest of your family? The biggest mistake most grownups make is that they assume that the children will get over it. Or that they're too young to understand. And like I said earlier, that's a mistake. I'm not a psychologist or counselor so everything in this blog is based off of my experience and for educational purposes. After all, I am a mother. 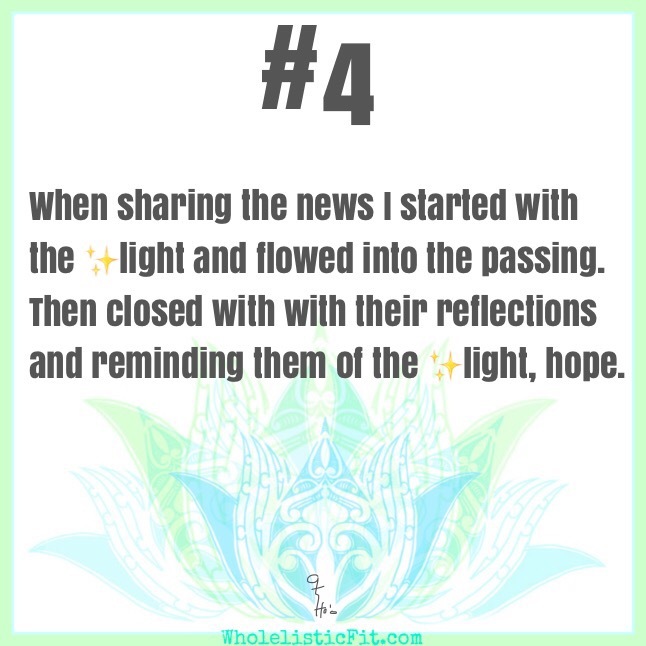 These "5 Steps" are from my experience and I wanted to share it with you. And hopefully you will make it your own and translate this example into your holistic lifestyle. Keep in mind that these are only suggestions and ideas. The goal is to approach the next few steps with an opened mind. The old saying, "You can't change what you won't acknowledge. Accepting the loss is helpful because you will have to translate the process through your body language. Why? Because every single child is good at reading body language. They're like mini mirrors, reflecting what influences them. Your ability to feel the circumstance will help them flow through it. Before I shared the news I journaled all the good traits and characteristics about this person. I also remembered a few funny stories. What is it about this person that I want them to remember? How do I want them to remember this person? Good food can do wonders for the body while sustaining the mind. It hugs our senses with warmth and allows us to find peace. Dealing with the loss of a loved one can be emotionally draining, and we might not want to eat. However, breaking bread gives us a chance to share in the grief and healing. Sitting face to face allows us to connect. I opened the conversation with, "Remember..." and naturally flowed into the news. Using the list I made from #2, I was able to share a few of the qualities. Once I delivered the news I gave them time to reflect their feelings. Holding them if need be. Then I closed it with, "Remember..." and passing the torch by filling their minds with all the good. Extending the light. I gathered the Ohana, family, by the table to say grace over the food and the memory. After all the tissues and tears we managed to make our plates. Fumbling over the meal and somehow found laughter in the midst of it all. I know it's not over but this starts the process. The pain of loosing a loved one will never go away but new memories will fill our hearts. The goal is to create a ton of happy ones while honoring their light. And this is the circle of a holistic life. I'm putting the finishing touches on a 12 Day eClass or book club, either way it will be 12 Day's to walk with me as we WALK IN BEAUTY. No purchase necessary but I will be using my ebook: WALK IN BEAUTY, as a guide. I'm extremely excited to share this 12 Day eClass. If I could offer you inspiration, motivation and hope that would be through my Instagram page. Connect with me on a weekly basis as I share prompts, quotes and mini-vlogs to help you live holistic. And even better, tag your friends and family because there's nothing like a good share.